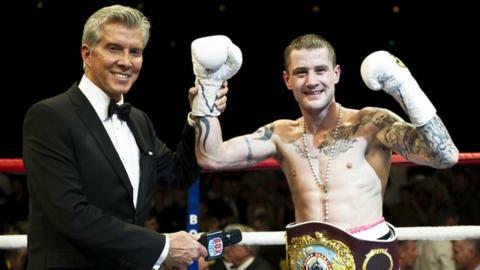 Ricky Burns' thrilling fourth-round stoppage of Kevin Mitchell in Glasgow on Saturday night to retain his WBO world lightweight title extended Britain's great summer of sport into the autumn. He is a working-class hero unaffected by his achievements in winning world titles at two weights. There's no inflated ego to skew his judgement or act as a buffer between him and his army of supporters. Into the media conference he strolled after his triumph over Dagenham's Mitchell, clutching a fan's carrier bag "to get stuff signed by Kevin" - no minders, no PR guys, more a "thanks for hanging about, lads, how can I help you?" Such is his character, that if he were to have taken the bus home after the bout one wouldn't have been surprised. Burns' recent fights have been broadcast on pay tv: had they been shown on regular TV, his fame would be greater still. But the channel's viewers and the 10,000 fight fans who packed into the SECC know they witnessed something special from the 29-year-old Coatbridge fighter. There were about 1,500 backing Mitchell, their chants adding to the cacophony before a highly polished man in a dinner suit took to the ring: legendary American MC Michael Buffer will seldom have had an easier gig. His astonishing vocal repertoire, with consonants and vowels whipped around the arena, quickened pulses and made palms sweat. When Buffer roared "Let's get ready to rrrrruuuumbllllllle!" the atmosphere became so charged it could have powered Glasgow's homes for the night. Burns' entrance to the arena hit a glitch when his music would not play - "My pal burned me off a CD and it didn't work" - but that was the only flaw in his evening. At the Fighting Scots gym last Monday Burns told BBC Scotland that people cannot comprehend the difference in him on either side of the ropes. When the fight began, the contrast was again unimaginably stark as he set about lion-hearted Mitchell, his friend for many years, with an aggression that is impossible to trace when he is in his civvies. Both fighters landed punches in a tight opening round but in the second it became apparent that Burns' greater force, what he calls his "man strength", would be a telling factor. Like Burns, Mitchell has moved up from super-featherweight to the 9st 9lb lightweight division, but the additional poundage is more evident in the champion. "We knew he had quick hands. He caught me a couple of times," said Burns. "But I don't mind taking a shot to land one of my own. I enjoyed myself out there. "When he went down for the second time, I was thinking, 'do I go in to finish it off here or do I let him off the hook', because I didn't know how much time was left. "But I just threw caution to the wind. The ref did the right thing and jumped in and stopped it because I wasn't stopping punching." For promoter Frank Warren there was pride in steering Burns to new heights and encouragement for Mitchell, another in his stable and as sporting a loser as one will find. "Ricky Burns is without a doubt the best fighter we've got in this country," said Warren. "This fella keeps improving. He will unify titles. "He has a fantastic work ethic in and out the ring and I think that's what makes him the fighter he is." Burns heads to Las Vegas now for a holiday with his wife, hoping to sneak in a bit of sparring with Floyd Mayweather. Warren has 8 and 15 December pencilled in for the Scot's next bout. If Burns were to try to add the other lightweight crowns he would most likely have to cross the Atlantic. Mexican Miguel Vazquez and Antonio DeMarco hold the IBF and WBC belts respectively, while Miami-based Cuban Richard Abril possesses the interim version of the WBA strap. "There is definitely more to come. I am comfortable doing lightweight," said Burns. "I think we've got another year or two at this weight, though I have got the frame to move up to light welterweight." With every fight, Burns adds to his array of talents and wins new admirers. His achievements deserve acclaim across the UK and beyond. Follow Keir Murray on Twitter.